-The University welcomed a record first-year class of 1,272 students on move-in day. The class included 46 Valedictorians and 11 Salutatorians, 2 National Merit Finalists, 21 Lilly Scholars, and 45 21st Century Scholars. -A Gallup-Purdue Index study found that Butler alumni are thriving personally and professionally. Butler outperformed its peers across most items in graduates’ assessment of their student experience including faculty support and experiential learning, affinity for their alma mater, and overall well-being. -Investigating the Rubik’s cube, comparing contracts for restricted free agents in the NBA, and constructing Cantor polynomials were just some of the research projects Butler students undertook at Mathematics Research Camp, an eight-day intensive experience designed to introduce students to mathematical research. 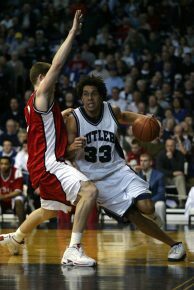 -Joel Cornette, a key member of Butler's first Sweet 16 team, died. He was 35. A celebration of his life was held at Hinkle Fieldhouse on August 22. The University established the Joel Cornette Scholarship Fund, which will provide scholarship support for future Butler Bulldogs. Contributions in honor may be made online. -Butler was awarded a $600,000 Indiana State Department of Health grant for a two-year project to determine whether dementia patients’ lives can be improved through the use of personal musical playlists. In the project, called Music First, faculty and students from across Butler—in Psychology, Music, Pharmacy, Communication Disorders, and other areas—studied 100 residents in the American Village retirement home throughout the 2016–2017 academic year. -Professor Emeritus of Music James Briscoe, Professor of Education Suneeta Kercood, and Professor of Communication Ann Savage were honored with Butler University’s 2016 Distinguished Faculty Awards. -President James Danko was reappointed as the BIG EAST conference’s representative on the NCAA Division I Presidential Forum. -Speaking as part of Academic Day, author Kelsey Timmerman told first-year students that they should do volunteer work, study abroad, and incorporate one thing a day into their lives that provides someone else with genuine opportunity. 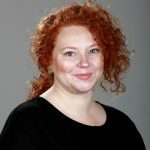 -Bekah Pollard ’16, an Art + Design major, was awarded a 2016 Arts Council of Indianapolis Arts Journalism Fellowship to produce stories for The Indianapolis Star. 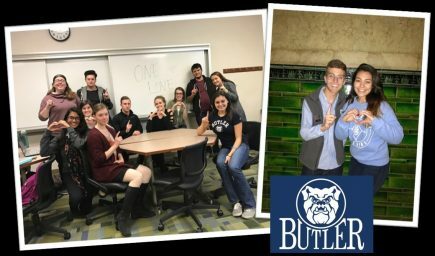 -Over 1,200 volunteers participated in Bulldogs Into the Streets, Butler’s annual service program. -The old pool section of Hinkle Fieldhouse, which has been converted into a weight room, training center, and administration offices, received LEED Gold certification from the U.S. Green Building Council. The removal of the pool was part of the $34 million renovation of Hinkle Fieldhouse, which took place in 2013–2014. 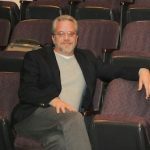 -Associate Professor of Theatre Rob Koharchik and Butler Theatre alumnus Jeffery Martin ’93 each received one of the "surprise" $10,000 awards given by The Indianapolis Foundation to Indianapolis-based organizations and individuals. Koharchik and Martin were recognized under the category “Indy Professional Theatre MVPs,” creative professionals whose work in theater contributes to the vibrancy of the cultural community and the strength of our city. -Fairview House, the new $43 million, 633-bed residence hall located along Sunset Avenue, officially opened. The residence hall features three- and four-bedroom pods with two students to a room. Each pair of students shares a bathroom, and each has his or her own sink and large closet. -Butler participated in a weeklong celebration of Indianapolis native Kurt Vonnegut with Butler Theatre’s staged reading of Vonnegut’s play Happy Birthday, Wanda June and Indy Opera’s world premiere of the opera version of that play, with music written by Butler Music Professor Richard Auldon Clark. -The Center for Urban Ecology (CUE) was awarded a three-year, nearly $300,000 grant from the National Science Foundation to establish the CUE Farm on campus as a hub for undergraduate education and research. The money supports Butler faculty in the development and implementation of four urban agriculture research modules in biology, chemistry, ecology, and environmental science courses and to study the impact of those modules on student learning. 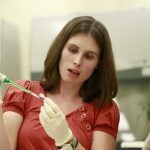 -Assistant Professor of Biology Lindsay Lewellyn was awarded a $410,656 National Institutes of Health grant to study egg development in fruit flies, which ultimately could lead to breakthroughs in the area of human infertility. The money is being used to pay for students to work in the lab over the summer, presenting findings at research conferences, hiring a full-time research technician during the academic year, and supplies. 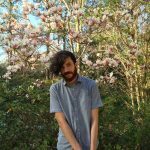 -Kaveh Akbar MFA ’15 was one of five recipients of the 2016 Ruth Lilly and Dorothy Sargent Rosenberg Poetry Fellowships, a $25,800 prize intended to encourage the further study and writing of poetry. The fellowships are available to all U.S. poets 21 to 31 years old. -Delorean J. Menifee was named Director of Admission. -Butler University and the Center for Urban Ecology were inducted into the Green Lights Hall of Fame. The Green Light Awards—a series of climate solutions compiled by Sustainable Indiana 2016 as part of the Bicentennial—are distributed to organizations and individuals who are at the forefront of promoting sustainability across the state of Indiana. -For the second consecutive year, Butler University was ranked as the Most Innovative School among Midwestern Regional Universities, according to the 2017 edition of U.S. News and World Report Best Colleges. Butler was also recognized in the categories of Best Undergraduate Teaching and the Best Colleges for Veterans, and appeared on the national shortlist of excellence for First-Year Experience, Internships, Undergraduate Research, and Study Abroad. 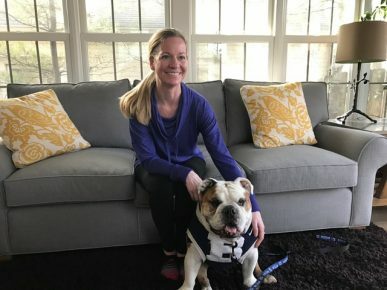 -Butler was named one of the 26 healthiest colleges in the country by Greatist.com, a website devoted to healthy living. -CommonLit Inc., a company run by Michelle (Skinner) Brown ’09, received a federal Department of Education grant to help fund and expand the organization. CommonLit Inc., a completely free, online compilation of literary and teaching resources that was created to try to close the “secondary literacy gap,” will receive $3.9 million over two years. -At the annual Alumni Awards Recognition Program for extraordinary professional achievement and service, Butler honored nine alumni: Butler Medal, John Hargrove ’69; Butler Service Medal, George Geib; Robert Todd Duncan Alumni Achievement Award, Jen Christensen ’94; Katherine Merrill Graydon Alumni Service Award, Maribeth Zay Fischer ’74; Hilton Ultimus Brown Alumni Achievement Award, Shawn M. Gage ’04, PA-C; Joseph Irwin Sweeny Alumni Service Award, Amy N. Lenell ’07, PharmD, CLC; Ovid Butler Society Mortar Award, Chris ’79 and Sally (McFarland) ’81 Wirthwein; and Ovid Butler Society Foundation Award, Jennifer L. White ’00 and David White. -Associate Professor of Education Katie Brooks was awarded a $2 million U.S. Department of Education grant to train 80 current or potential teachers to become licensed to teach English Language Learning students. The five-year grant is intended to help alleviate the chronic shortage of English as a New Language (ENL) teachers. The grant will pay for 20 college graduates who have a bachelor’s degree in a licensable area such as biology, math, social studies, world languages, or English to get both a teaching license and an ENL license. -The Board of Trustees elected Attorney Robert T. Wildman and Life Sciences executive Lynne Zydowsky ’81 to special one-year terms on the Board. Both will be eligible for full three-year terms in June 2017. Wildman is a member of the Business Services Group, the Venture Capital and Private Equity Group, and the Real Estate Group of Bose McKinney & Evans LLP. 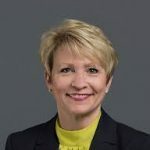 Zydowsky, President of Zydowsky Consultants, is an experienced executive in the Life Sciences industry who has been involved in the launching and building of many successful companies. 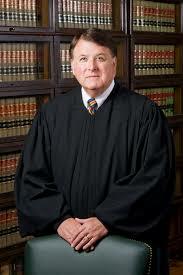 -Longtime Professor of Voice André Aerne died on Sunday, October 16, in Petoskey, Michigan. He was 84. Aerne taught at Butler from 1966–1998 and also was often featured as a soloist in the Romantic Festival programs. -Butler’s first Mock Mediation team did well at the Brenau Invitational Mediation Tournament in Gainesville, Georgia. Russ Hunter ’17 and Anthony Murdock ’17 both took home “Top Mediator.” Hunter also was awarded “Top Advocate/Client,” as was his teammate Nick Fox ’18. -Forty-nine members of FFA (Future Farmers of America), who came from as far away as Massachusetts, Connecticut, Arizona, and Washington state to attend the annual FFA convention in Indianapolis, took a tour of the CUE Farm at Butler to see how the University is approaching sustainable, environmentally responsible urban farming. 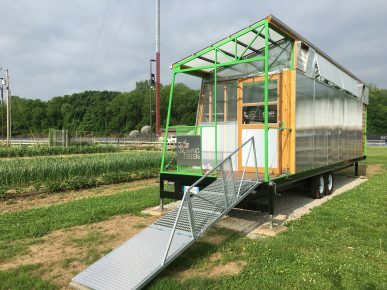 -The Center for Urban Ecology Farm became the new home of the first fully automated mobile greenhouse, an 8-foot-wide by 32-foot-long structure designed and built by Ball State University architecture students to enable the CUE Farm to start plants earlier in the season. The $50,000 project was built with a grant from the Butler Innovation Fund. -Erin Vincent was hired as Director of Academic Program Development and Innovation, a new position designed to help faculty, staff, and administrators move new academic programs from an idea to program launch. -Brandie Oliver, Assistant Professor of School Counseling in the College of Education, was named Indiana School Counselor Association Counselor Educator of the Year. -The Center for Citizenship and Community celebrated its 20th anniversary of connecting Butler students and the University with the community. -A team of five Butler University students won the Purdue University Parrish Library Case Competition, an annual contest that challenges students to use their business research skills to solve a problem for a company. Sammie Chalmers, Taylor Gillenwater, Nicole Henrich, Karly Krebs, and Allison Wolff beat more than 20 teams from Indiana University and Purdue University. -Eight Lacy School of Business students took the annual Wall Street Trek trip to get a good look at Wall Street—JPMorgan Chase, the Stock Exchange, Blue Mountain Capital—and Johnson & Johnson headquarters in New Brunswick, New Jersey. 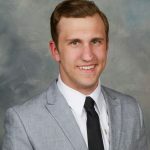 -Junior Jacob Reeves won the 2016–2017 Hendricks Fellowship for his project studying how wildlife use Butler University’s campus as their home. 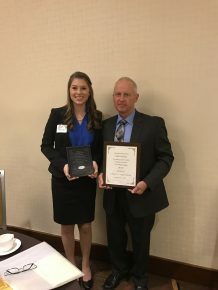 The Center for High Achievement and Scholarly Engagement (CHASE) awards the scholarship to a student who completes a scientific research project in the area of conservation or Indiana ecosystems. -Jacklyn Gries, a second-year Pharmacy major from Evansville, Indiana, was selected as Butler’s 2016 winner of the Independent Colleges of Indiana’s Realizing the Dream scholarship. This scholarship goes to students who are first in their families to go to college, have been selected by their colleges for outstanding achievement in their first year, and are successfully advancing towards completing their bachelor’s degrees. -Butler became the first Indiana school to be invited to present at a Teach to Lead Preparation Summit held in Washington, DC, by the federal Department of Education. -Patricia Cochran, the great-great-granddaughter of Butler University founder Ovid Butler and great-niece of two-time Pulitzer Prize-winning author Booth Tarkington, died on December 5. She was 97. -Sigma Gamma Rho, the sorority founded at Butler University on November 12, 1922, gave Butler a gift to establish the Sigma Gamma Rho Sorority Inc. 7 Founders Endowed Scholarship to honor the seven education majors and public school teachers who started the organization. The scholarship will be awarded annually beginning in the fall to a student enrolled in the College of Education. -The curtain rose on the new Theatre Department Scene Shop, which moved from cramped quarters in the basement of the Holcomb Building to much larger, well-ventilated space in the west side of the Sunset Avenue Parking Garage. Half the space will be used to build scenery for Theatre productions; the other half will be used for costume storage for the Theatre and Dance departments. -Victoria Kreyden ’17, a Biology/Spanish double-major from Carmel, Indiana, won first place in the undergraduate poster session at the 2016 American Society for Cell Biology (ASCB) meeting in San Francisco, California, for her poster presentation Investigation of the neuronal functions of the SUMO conjugating enzyme UBC-9 at the C. elegans neuromuscular junction. Kreyden’s presentation was judged best of more than 100 by undergraduates from around the country and abroad. -Veteran police officer John Conley succeeded Ben Hunter as Butler University’s Chief of Public Safety. Conley joined the Butler University Police Department in 2014, after working with the Indianapolis Metropolitan Police Department (IMPD) for 40 years. 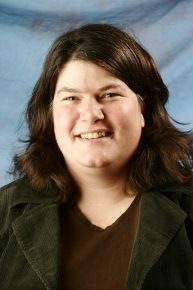 -Associate Professor Kelli Esteves, who has taught in the College of Education since 2010, was named the Richard W. Guyer Chair in Education. -Responding to a note on Facebook, Tracy Tyndall Pabst ’98 donated a kidney to Laura Coker Blandford ’97. The two were Delta Gamma sorority sisters but not close friends. -A three-judge panel from the Indiana Court of Appeals heard a case on the Butler campus as part of its Appeals on Wheels program that brings the court to different locations to show the public what it does. -Thirteen Indiana public school superintendents from all over the state began to participate in the first EPIC (Educators Preparing Inspired Change), a joint venture of Butler University and the Indiana Association of Public School Superintendents to help great educators transform the business and constituent-services aspects of their work. -Singer Ben Davis, who spent a couple of years as a Butler student, returned to the Clowes Memorial Hall stage for the first time in 20 years, this time as Captain Georg von Trapp in the national touring company of The Sound of Music. -Jason Davidson ’01, an instructor in the Lacy School of Business, wrote a book on Visual Basic for Applications, the popular programming language that is used to create and customize Microsoft Office programs. VBA for Microsoft Office 2016, published by Pearson, is a 216-page, step-by-step guide that’s geared toward students. -Professor of Music David Murray was awarded the International Society of Bassists’s 2017 Special Recognition Award for Solo Performance, which goes to a person “who has contributed special skills, knowledge, projects, and other such positive works in the furthering of ISB ideals.” The award is given every two years by the organization, which represents nearly 3,000 members in more than 40 countries. -Butler students to make the trip to New York to be part of National Retail Federation’s Big Show, the annual showcase for retail merchants that also lets students see the enormous variety of career options available to them in retail. -Butler University placed 808 students on the Dean's List for the fall 2016 semester. -A NASA representative brought moon rocks to College of Education Professor Catherine Pangan’s Science and Social Studies Methods class. -The Butler Muslim Student Association hosted a Unity Walk around campus to protest the federal government’s attempted ban on Muslim refugees and immigrants from seven Muslim countries. -Students and supporters participated in the Polar Plunge, raising over $53,000 for Special Olympics Indiana. -The second annual Day of Giving shattered expectations, with faculty, staff, students, alumni, parents, and friends making 887 gifts totaling more than $137,000. In addition, the University was able to “unlock” more than $103,000 in challenge funding. 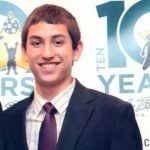 -Isaac Warshawsky ’20 was selected as the second recipient of the Bruce and Lucy Gerstein Holocaust Education Travel Fund, which enabled him to visit Poland over spring break. -Beta Theta Pi was selected as the University’s new fraternity, with colonization of the Butler chapter to begin in fall 2017. A location for a future chapter house will be determined, and the University will assist in selecting the site. -Butler’s men’s basketball team advanced to its first Sweet 16 since 2011 with a 74-65 win over Middle Tennessee State. -Juniors Alex Tison, Claire Cox, and Kaylynn Cline were flown to Chicago to appear on an ESPN quiz show called Bracket Genius. -Associate Professor of Music Education Daniel Bolin was selected as the 2017 inductee to the Gamma Chapter, Phi Beta Mu Hall of Fame. Phi Beta Mu is the highest honorary fraternity for international band directors. 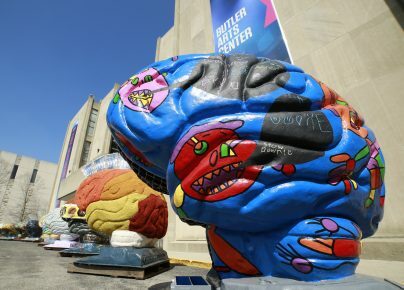 -Twelve 5-foot-by-5-foot brain sculptures, each linked to a different theme in neuroscience, went on display on campus for six weeks as part of One Butler: The Brain Project. The sculptures, commissioned by neuroanatomist Jill Bolte Taylor, were displayed throughout campus. -The Center for Urban Ecology Farm began to pursue mushroom cultivation, thanks to an Indy Urban Mushrooms grant from the U.S. Department of Agriculture’s North Central Sustainable Agriculture Research and Education program. 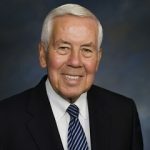 -Butler University sophomore Lauren Ciulla struck gold, earning the Congressional Award Gold Medal, the U.S. Congress’s award for young Americans who set and achieve goals in four program areas: voluntary public service, personal development, physical fitness, and expedition/exploration. 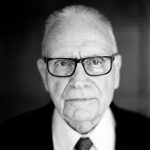 -The estate of Winstan R. “Bud” Sellick ’47 and his wife, Jacqueline (Blomberg) ’44, has given $9.4 million to the University. The gift will be shared among Butler Athletics, the Lacy School of Business, and general University support. 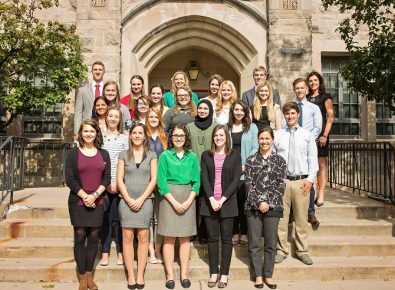 -Twenty-six Butler University students were elected to Phi Beta Kappa, the honor society that recognizes the best and brightest liberal arts and sciences undergraduates from 286 top schools across the nation. -Education professors Susan Adams and Brooke Kandel-Cisco were part of a team recognized with a B.E.S.T. Award from WFYI (Channel 20) for its “exemplary work ethic and performance” and its efforts to develop a curriculum guide for the station’s documentary Attucks: The School That Opened A City. -Four Butler students were named Top Four Paper Winners at the University’s 2017 Undergraduate Research Conference. Kelsey McDougall, John Anderton, Taylor Pearson, and Viki Tomanov’s projects were judged to be the best among the 21 students from five different universities who submitted their completed papers for competitive review. 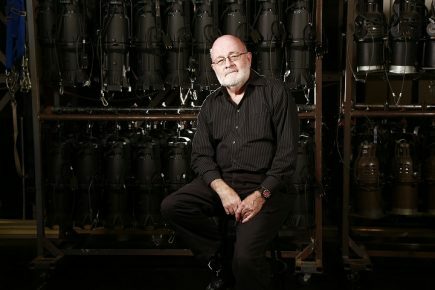 -Theatre Professor Owen Schaub announced his retirement after 37 years at the University. “Having been at Butler has been a very warm, rewarding, and humane experience,” he said. Other professors who retired this year after long tenures at Butler include Katarina Dulckeit, Richard McGowan, Jeanne Van Tyle, Laurie Pylitt, and Stanley DeRusha. -Frank E. Ross III, a national leader in student affairs with 22 years of experience and degrees from both Ball State and Indiana universities, was named Vice President for Student Affairs. He will take over the position in June. -Madison Sauerteig, a junior from Arcadia, Indiana, who has done extensive volunteer work with Riley Hospital for Children, received the 2017 John Weidner Endowed Scholarship for Altruism. -Junior Caitlyn Foye, a Biology major from Newburgh, Indiana, was named a 2017–2018 Goldwater Scholar, the most prestigious undergraduate award given in the sciences. -A $5 million financial contribution from Old National Bank will be used to create the Old National Bank Center for Closely Held Business, which will provide privately owned businesses throughout Indiana with training, education, mentoring, and networking opportunities to help them succeed. -The Lacy School of Business’ student-run insurance company began operations after the Bermuda Monetary Authority granted licensing approval for the business. The company was created to give students hands-on experience and prepare them for an industry that is anticipated to need tens of thousands of new employees over the next seven years. -Students, faculty, staff, and alumni signed a steel beam that will be part of the construction of the new 647-bed housing unit that will replace Schwitzer Hall. The first occupants of the new housing will move in in August 2018. 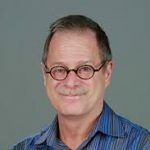 -John Lechleiter, retired CEO of Eli Lilly and Co., told the spring 2017 graduates that they should set their sights high and strive for excellence, treat others the way they would like to be treated, and think and act independently. 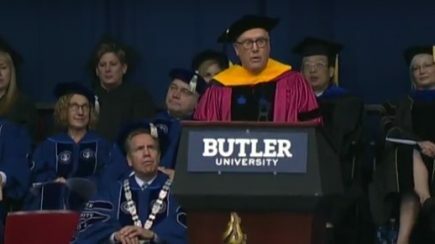 Butler graduates 955 students on May 6, 2017.